All year round plant parts can be found and used to create special jewellery pieces. I was in experimental mood today and with just a few tools to work my favorite medium, precious metal clay, I made a bracelet with unique links. After rolling out the clay to 1mm I placed tiny leaves and seed pods onto it. One more go with the roller over the parts gave me interesting impressions and with a round cutter hovering over them I decided which areas I wanted as my circles. Under my desk lamp they dried very quickly so I could remove the sharp edge with a foam-backed sand paper before firing them. The holes can be drilled at that stage but I decided to use a hole punch after the firing. With a brush I applied a solution of liver of sulphur to the fired and polished pieces which turns black and gives that wonderful 3D effect. Oval jump rings and a clasp complete the "Nature Walk" bracelet which will become a sample piece for my classes. 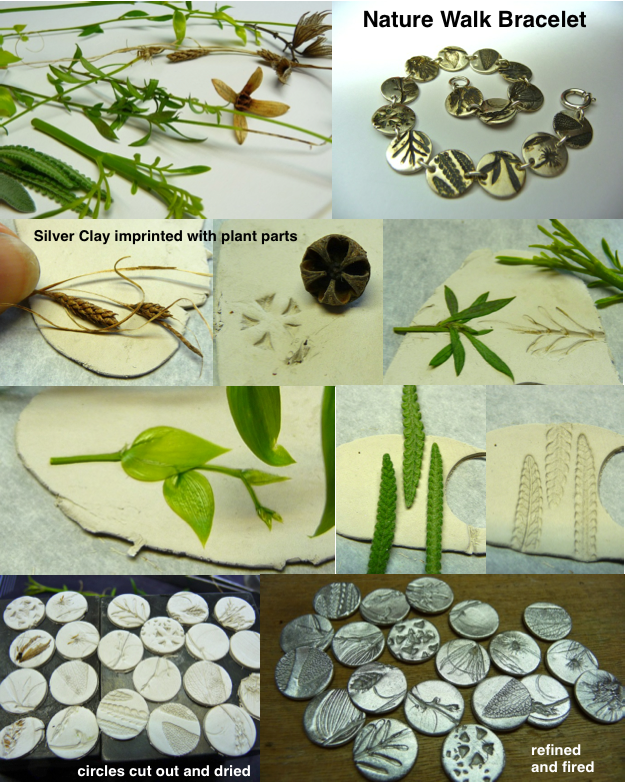 It will show how favorite plants can be used to also make beautiful pendants and earrings. That is so beautiful! Thank you for explaining your process, it is so interesting to see it appearing step by step!